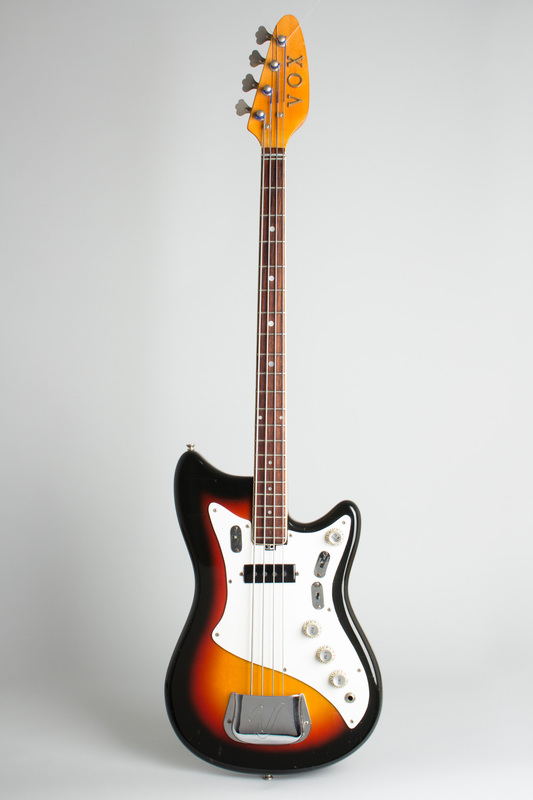 Vox Hawk IV Model Solid Body Electric Bass Guitar (1968), made in Recanati, Italy, serial # 386273, sunburst polyester finish, mahogany body, laminated maple neck with ebony fingerboard, original grey hard shell case. While there are not many bass guitars we'd describe as "cute," the diminutive Vox Hawk IV certainly qualifies. This model was one of the final Vox bass designs, an evolution of the Panther, itself the Italian-made descendant of the original JMI/Vox UK-made student basses of the early-mid 1960. With a small, vaguely Fenderesque body and VERY thin 30" scale neck, the Hawk is extremely handy to play, and to a full-size player feels almost toy-like. This model also has a special feature specific to Vox in 1967-8: onboard transistorized effects pioneered by the company in this period. Amazingly even this beginner's bass is equipped with a "distortion" circuit, an onboard fuzzbox adjustable from a sizzly buzz to a white noise maelstrom. 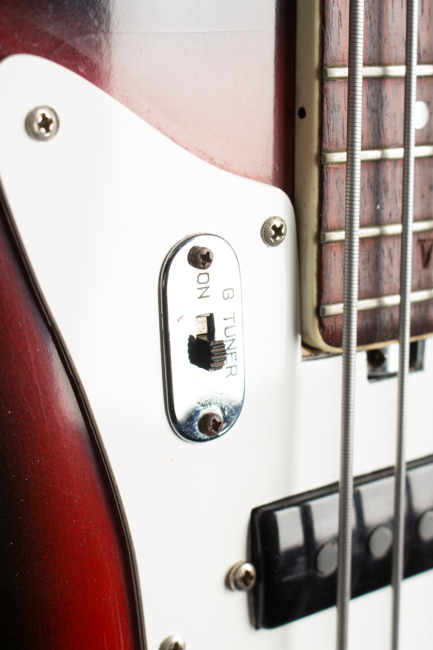 The rotary Treble-Bass boost is quite effective, especially in the Bass position. 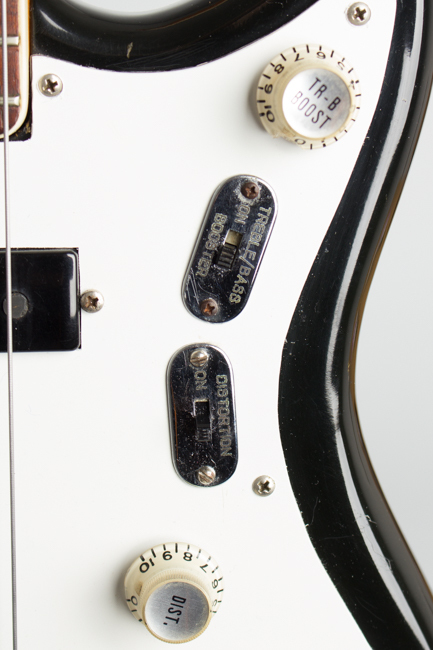 There is also a "G" tuner, more important in the pre-electronic tuner days of 1968 and still working. 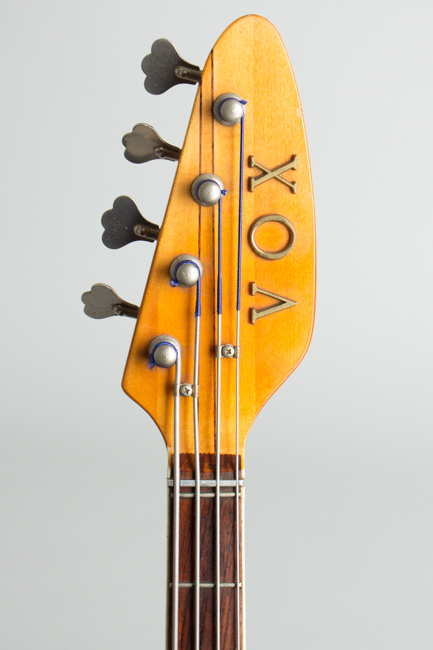 These third generation 1967-68 Eko-made models are some of the nicest of all Vox instruments in terms of build quality and fretwork, and although still definitely built to a price, the Hawk IV is a well-designed and quite useful lightweight bass. The single wider-coil Vox bass pickup is set close to the neck and gives an amazingly full tonal response, controlled with volume and tone knobs-and then the added active circuit adds another dimension! Designed for young student and teenage garage band use, and remains an excellent starter bass, suitable for kids or players with small hands and even as a knock-around recording bass-with a fuzzbox inside it! With a sunburst poly body finish and natural finish laminated this little bass still looks great. Like most Vox-branded instruments sold in the US, this Hawk was built at the Eko factory in Recanati, Italy for the American distributor, Thomas Organ. Vox's parent company JMI (Jennings Musical Industries) in Dartford, Kent was already overstretched by 1964 supplying Vox amplifiers to the UK and world markets, so instead of expanding their meager guitar-making facilities, Jennings outsourced the great bulk of instrument production to the Italian firm. These Eko-made Vox guitars are more consistent than their English cousins, and in many cases are better playing instruments. 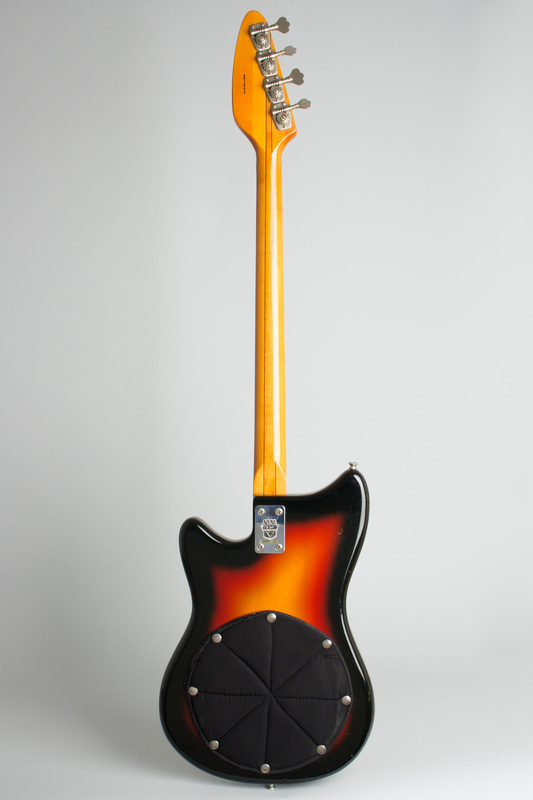 By the time Thomas in California formalized American distribution of JMI's products in 1965, nearly all Vox guitars would be of Italian parentage. They were quite popular in the US at the time and remain cool, very playable relics of their period, always brimming with the 1960s vibe. 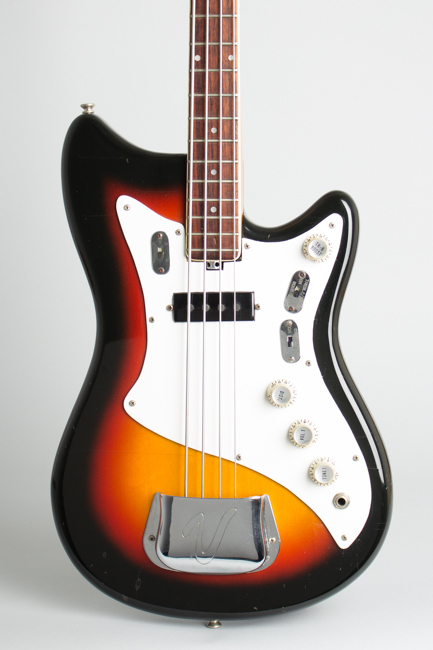 This one remains a very playable piece of Vox history, and just a super cool little bass. Overall length is 42 1/8 in. (107 cm. ), 11 3/4 in. (29.8 cm.) wide at lower bout, and 1 1/2 in. (3.8 cm.) in depth, measured at side of rim. Scale length is 29 3/4 in. (756 mm.). Width of nut is 1 7/16 in. (36 mm.). 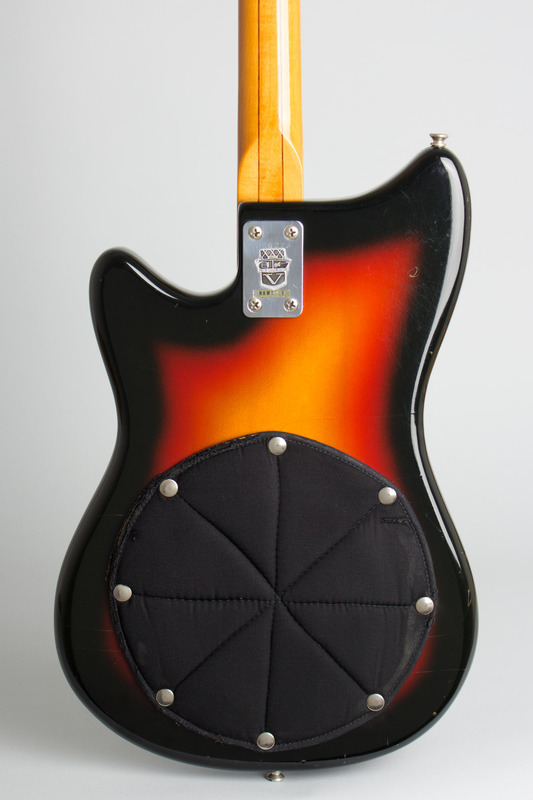 A nice clean example overall, complete and original except for a reproduction pickguard (the originals often shrink and crack badly). 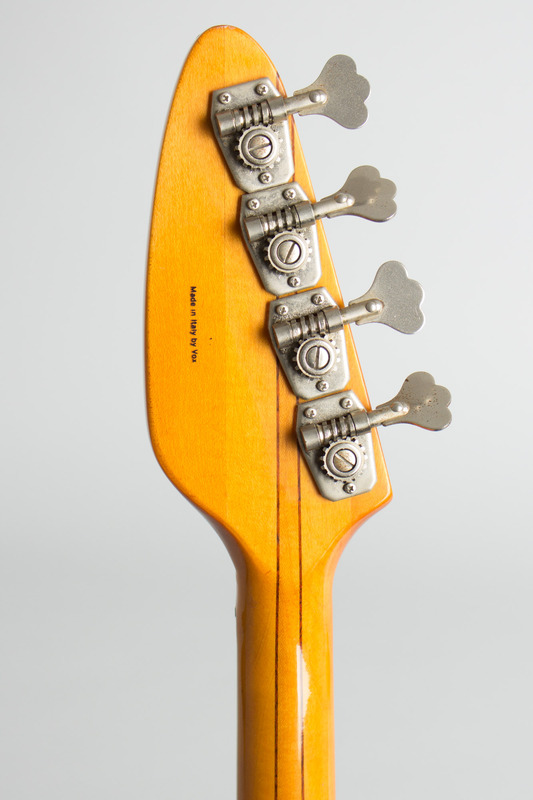 There is some light wear overall, some small dings, and one short repaired lamination crack in the back of the neck (very common on these Italian-made necks) that is not causing any problems. The frets show almost no wear, the neck is dead straight, and this is a delightful little bass to play. Excellent Condition.